Mr. Hublot lives in a world where everything is mechanical — including pets. It’s a universe where the giant scale of machines and the relentless use of salvaged materials reign supreme. 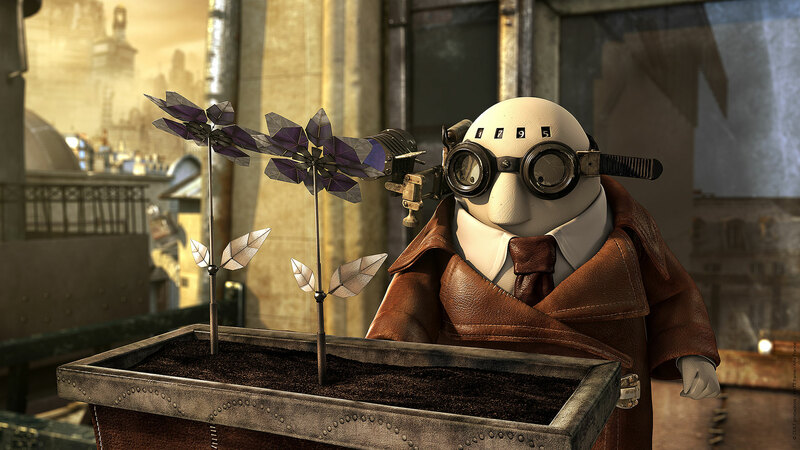 Mr. Hublot, a withdrawn, idiosyncratic character with OCD, must break out of his shell when a robot dog is left abandoned on the curb outside the place where he lives. The film won the 2014 Academy Award for best animation. Written, produced and directed by Laurent Witz. – Visit the film’s website at mrhublot.com. – Watch a trailer at mrhublot.com. – Read an interview with the filmmaker at cartoonbrew.com. – Visit the film’s Facebook page at facebook.com. – See the film’s IMDb entry at imdb.com. A little girl wants a puppy … real bad. Her obsession is driving her parents crazy. Will her persistence break through her parents’ stone cold hearts? While the story may be familiar to anyone who has wanted a dog, her creative storytelling technique will have you in tears by the end. Animated by Zoe Lubeck. – Watch the film, below. The memory of a long lost love triggers an old man to recall the odd set of circumstances that led to his having a grenade as a heart and a monkey inside his head. A wildly inventive and visually amazing film inviting comparisons to the work of Terry Gilliam and Tim Burton. The film is directed by Brent Bonacorso and based on the book of children’s essays entitled The Colored Monster Has No Mouth by Roger Omar. Principal cast: Jacob Whitkin, Michael Garbe, Amber Noelle and Christopher Tomafelli. – Read an interview with the filmmaker at filmmakermagazine.com.